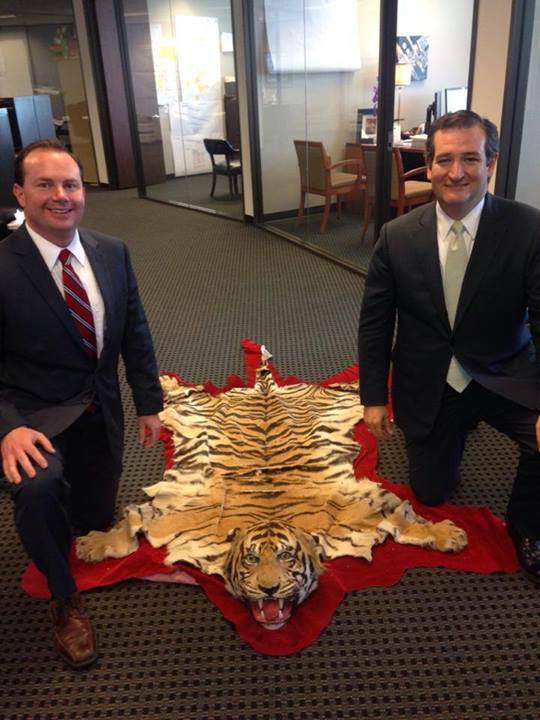 US Senator buys tiger skin rug? Senator Ted Cruz of Texas, is described on his website as “A passionate fighter for limited government, economic growth, and the Constitution.” The senator graduated with honors from Princeton University and with high honors from Harvard Law School. No doubt he is an intelligent man. Why did he post an outrageous, insensitive statement and photograph on his Facebook page of a tiger skin rug? All of times, April 22, just one day after Earth Day, The senator’s statement reads “Did a little shopping for the office with United States Senator Mike Lee in Houston today.” Perhaps the senator thought this was amusing, if so, why? As a fellow Republican and supporter of the Senator’s Cruz’s investigation of the IRS and the agency abusing its powers, I am shocked and dismayed. Perhaps Senator Cruz will give his constituents and his fellow party members an explanation. And no I am not a liberal tree huger environmentalist. I am a conservationist!